As other reviewers have mentioned, this book is quite Ocean's Eleven-esque, mixed with a bit of the Godfather and set in a fantasy city similar to Venice (in that its full of canals) and also full of sharks. Whilst describing it in that way may make it seem a bit strange and might put you off, it shouldn't. This book is absolutely AMAZING. It's seriously one of my new favourite books. Locke Lamora became an orphan in the aforementioned city (called Camorr) at a young age and bought by a man called the Thiefmaker, who turns orphaned children into his own little gang of thieves before then selling them into the bigger gangs of the city once they've grown up a bit. Locke however, has already been doing some thieving and despite his young age is full of attitude and doesn't fully foresee the conclusions to his actions. He's quickly then sold to a man known as Chains, who runs and trains a small gang of false-facers known as the Gentlemen Bastards - basically, they're con artists. That was the past. In the present, Locke and his friends are trying to pull off one of their biggest cons yet. But what they don't know is there are bigger things going on in the city, and Locke and his friends are soon going to be drawn into the heart of it all. I just loved this book. Firstly, the world Lynch has created is just so detailed and obviously well thought out. He's obviously thought a lot about the different areas of the city, the culture, the government, and all the different people and gangs and how they all operate, as well as the wider world as a whole. And this detail just permeates throughout the whole of the novel and you even get a feel for the culture and nature of the world without Lynch necessarily having to spell it all out for you. The book is nicely set out as well. The chapter alternates between 'present' chapters as it were, following the main action of the plot as Locke and co. begin their latest con and all the drama the subsequently unfolds afterwards. These are then punctuated with Interludes, providing other relevant details and stories related to the world and the plot. 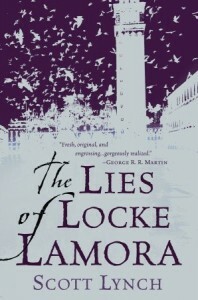 At first these mostly relate to the past of main characters such as Locke and Jean, but later these Interludes also include other brief stories relating parts of the history of Camorr, helping to flesh out the world and provide other information that directly or indirectly relates to the plot in a way that is quite natural and doesn't detract from the rest of the story or halt the plot. At first it was hard to get used to the world and the characters but I soon found myself immersed and caught up. The characters though, are what I loved most. Locke is charismatic, intelligent and arrogant, and the best false-facer of the gang and their leader. He has many of the typical qualities of a protagonist. But he also fells increadily real. He isn't perfect. For a start, he isn't overly strong and is a terrible fighter, often relying on his friends (particularly Jean Tannen) to help him in any physical conflict. He's obviously grown significantly, particularly from the past segments to the present, but he continues to grow. The aforementioned Jean Tannen is Locke's right hand man and his perfect partner - he possesses all the qualities Locke lacks and acts the muscle for the gang in many instances. But Jean obviously has a big heart as well and is more than just a bruiser. Next are the Sanza twins, Calo and Galdo. They're just so lovable and funny and mischievious. They're sort of Lynch's version of the Weasley twins from the Harry Potter series. I fell in love with them instantly. Finally there's the apprentice of the gang Bug, who obviously has a big heart and wants to fit in and sometimes tries too hard but you can't help but like anyway. They're all just such great main characters and I found myself loving them all and rooting for them all the way through, even as things became increasingly difficult and dangerous for them. I must admit as well, I was truly heartbroken when Calo and Galdo were killed off as they were my favourites up to that point. And then I was heartbroken further by the death of Bug. Why Lynch, why!? Readers should be warned that this book involves a LOT of swearing etc, but it does feel natural. It doesn't feel like Lynch is just throwing it in for the sake of it like it does in some books. And it can be gory in places too, but it's not that bad. I knew when I started reading this that there was a sequel book, and when I was reading it I assumed it would be the first in a trilogy. Some googling prior to writing this review tells me that Lynch has planned out 7 novels in this series, which interests me and I can't wait to see what happens next and obviously stuff is set up to be followed up in the next book(s). At the same time though, the story in this book is self contained, and you could easily not read any other books in the series but have a feeling of closure regarding the characters. Overall, this book is just amazing. It grabs hold of you early on and just doesn't let you go. You become drawn into the world and the characters and the drama that quickly unfolds and escalates. The book is brilliantly written and the world beautifully developed and realised. I cannot recommend this book highly enough and I can't wait to stuck into book 2!